Our system is 18, 175 watt, Sharp panels with inverter. Purchased from: http://www.heliopower.com After some delay due to poor weather, the instalation was absolutly clean and smooth. Not one flower was broken in the beds around the house, not one bit of trash was left behind. The crew was polite and respectful and did not disturb my family in any way. Helio Power has my highest recommendation, at least as of 2004. Costs: $21,000 base price less CEC Rebate @ $2.80/W ($7,305) less CA state tax credit @ 7.5% ($1,035) leaves $12,759 total out of pocket. Cash Flow: Assuming an average utility tariff of $0.17 (conservative) we should see a savings of at least $1,000/year so the worst case payback is in 12 years. Since the purchase price went on a home equity loan at 6%, over 25 years the payment will be about $82/month or a cost of $986.52/year. If energy prices continue to soar and the economy is weakened as a result, interest rates will stay low and my cash flow will continue to improve. Of course, if electricity rates fall, and interest rates soar... but that seems very unlikely at this point. R.O.I. : Since the system increases the sale value of the home by an estimated $17,493, We've increased our net worth almost $5,000 instantly. Since we could potentially sell the system for about $10,000 (value of the used system) our exposure is only $2,000 or about 2 years of the power bills. Since the panels are warrentied for 25 years, they will not decrease in value by any significant amount so payback should be in just over 2 years at worst. After that, part of each loan payment will increase net worth rather than the net worth of the local utility. The first power bill after the system was installed was $29 for Natural Gas. Zero electic use. That is in April, in SoCal, so it should represent a solid average for the year. After 1 year, the system has generated 5,000 Killowatt/hours = 13.7 kWh/day or about $1,400 worth of power over this years rates (if I am calculating the rates correctly). And that is with one set of pine trees from our neighbor's front lawn that were shading half the panels every morning. Those pines are gone now (the wood will heat our home next year, the chippings are mulch for our trees and garden). The variable interest rate on the equity loan is up to 9 percent, so we are paying about $104 per month or $1,248 per year. That leaves a net positive cash flow of $152 for the year. The left hand set of panels. The smoke stack for our wood stove is visable to the right. The right hand panels. The controller is in the lower left corner of the picture and the electrical conduit from the panels to the control can be seen comming down from the roof. 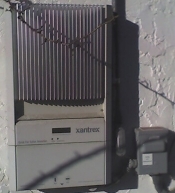 The controller / inverter and it's connection to the power grid. Not shown is the standard power meter, which does run backwards during the day. http://www.heliopower.com HelioPower specializes in ways to help you reduce or eliminate your electric bill. These include solar electricity, solar water pumping, solar pool heating, and tankless water heaters. http://www.visualsunchart.com Visual Sun Chart is a graphics program for visualizing solar shading from proposed buildings. Use Visual Sun Chart to determine if a site will have sufficienct access to the Sun's energy. 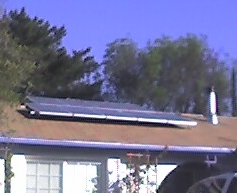 As of April 20, 2011, the system had generated 28,503 Kilowatt Hrs, 4840KHW since last year. 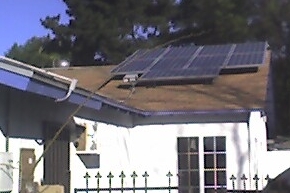 As of April 19, 2012, the system had generated 33,108 Kilowatt Hrs, 4650KHW since last year. As of August 2015, the new inverter had produced 9,207 Kilowatt Hrs. Exactly 5MWh more this year. It's interesting that this appears to be more than it produced the first year. Perhaps we had more sun / fewer cloudy days?